Vegetarians Taste Better: Nachos are an American delicacy, right? Nachos are an American delicacy, right? For reasons that I've never understood, catastrophic things seem to happen to me on or around holidays. Injuries. Fights. Feuds. Having to work. And this year was no different. I'll spare you the gory details, but let's just say that I'm glad for it to be Monday. After working an interesting shift at the Berea Animal Rescue on Saturday (Who adopts animals on the 4th of July? Apparently a lot of people!) I headed to the only place that was open - Whole Foods - for some grub. Not real nachos, though. 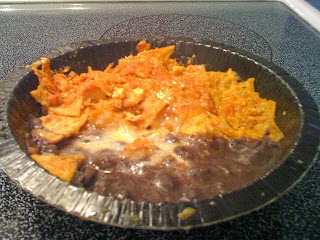 I purchased Amy's Tortilla Casserole & Black Beans Bowl. At 390 calories per bowl and with 18 grams of fat, it was a bit heftier than I would have liked it to be, nutrition-wise, but I was doing my best to partake in some down home American gluttony. Admittedly, this isn't the most appetizing looking entree I've ever made, but it did smell good. I tried the beans first and thought they were just ok. I tried the tortillas and also thought they were just ok. It wasn't until I got a fork-ful of each component and ate them together that I started to like the meal. And then I really enjoyed it. The beans could have been ok on their own, with more seasonings, but those tortillas definitely needed to be paired with something else. I concluded by gluttony-fest with a peanut butter brownie from Whole Foods. (That's such a dangerous store to be in when you're hungry and sad!) It was the highlight of my meal. But anything with peanut butter in it will always be the highlight of anything that I eat. I'd rate this bowl as "meh" at best, considering that it's on the fattier side of frozen entrees, but if I wanted another "sort-of-nacho-like" experience, I'd buy this meal again.